Ask the people in any room for a show of hands for who leaves the house to go shopping for unheard of brands in nondescript shops. No hands will go up. Wishy washy products and unremarkable, generic services certainly don’t motivate anyone. However, instantly recognizable market leaders, famous brands, cults and classics pack in plenty of appeal by projecting a purpose that’s engaging and compelling for both employees and customers alike. What Does Your Brand Stand For…And Upon? When working with our private clients or indeed delivering our open branding masterclasses and workshops we use the Personality Profile Performer™ System to develop all these key brand foundational elements for our clients’ or workshop participant’s brands. The outputs from the Personality Profile Performer™ then provide you with your brand blueprint or brand roadmap, together with the brand direction for your brand design application in brand collateral, brand communications strategy, training and so forth. Notice that purpose is one of the key building blocks for a strong brand foundation. This part of the brand foundation provides the critical direction for brand strategy, and consequently, for high performance with the laser-focused results marketers seek. Here we aim to show you how a well-defined brand purpose is inextricably tied to stronger brand performance. Since some employees and employers may say that the purpose of a business it to make a profit, it’s understandable that thought leaders must reiterate the actual meaning of brand purpose. 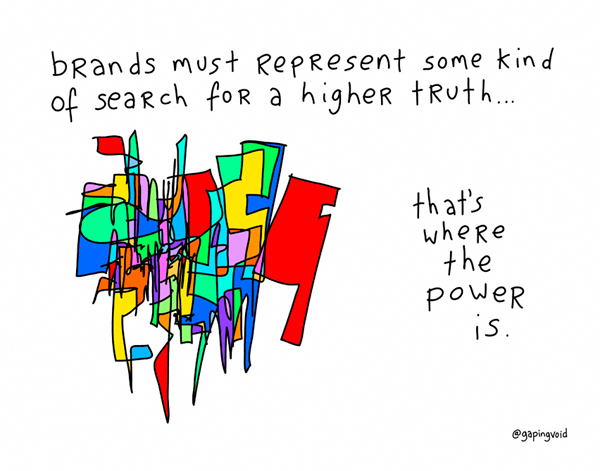 So, what is brand purpose and what is it not? Drucker and other experts observed that brand purpose is to create customers through superior products and services which have value and usefulness. In other words, customers do not shop and pay so that a company can become richer. They buy because they perceive value in their purchases. It’s important to note that 60% of branding is about perceived value and only 40% about the actual product or service, so how you communicate your brand’s mission, vision and purpose actually has a significant impact on your bottom line. This is why, for example, at their very foundation of purpose, Volvo family cars are built around a steel cage design to achieve maximum safety, Mercedes-Benz defines meticulous German engineering and innovation in luxury cars, and Tesla produces electric cars to decrease our dependency on gasoline. Purpose is also why one of the most successful brands on earth doesn’t just sell computers, but dreams up groundbreaking products such as the Apple Watch, iPads and iPods to create “insanely great products” that enhance peoples’ lives and that many people consequently want…a lot. When brands are able to connect and balance great storytelling founded on a clear vision, mission, values, and purpose, with the right product or service, then the magic happens. 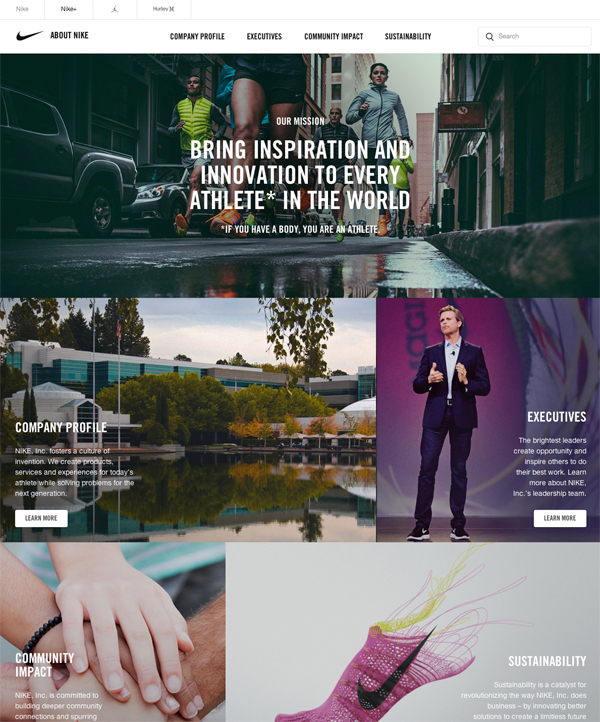 We look into three case studies from Coca-Cola, Wal-Mart Stores and Patagonia. One of the most successful adverts of all time, now enshrined in the National Museum of American History at the Smithsonian Institution, married the idea of happiness and universal love with the product. In a ground-breaking collaboration between advertising and the record industry, it was re-envisioned as a hit song rising to UK #1, as a Christmas advert and as a Disney collaboration for years to come. 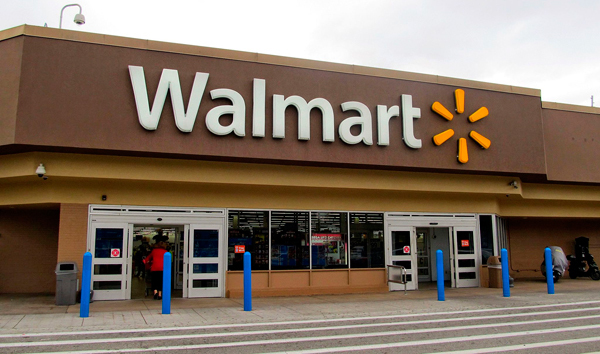 In America, Walmart has been reportedly criticized, rightly or wrongly for years, one issue after another. Non-union jobs at low wages that depress the job market, running small businesses out of town, accusations of racial and gender employee discrimination, foreign product sourcing, and environmental policies are a few of the themes that have splashed across the pages of various news publications and media. America’s largest retailer is also America’s largest employer. Wal-Mart Stores has also created America’s richest family with a fortune placed at US $149 billion. Yes, they have low prices in 5,000 stores. But, it’s fair to ask: What’s their brand purpose? What do they stand for? In keeping with the growing trend in other parts of the world, American consumers’ sense of values have become more focused on where products come from, how they are made, whether a company is doing the right thing for the environment, for sustainability, for its workers and for corporate citizenship, says Allen Adamson, North American chairman at Landor Associates in AdWeek. Since mid-2015, AdWeek reports Walmart is starting to turn things around by embracing brand purpose. Examples include partnering with actor and gender-equality activist Geena Davis for a hometown theater festival in Arkansas, speaking out against anti-gay legislation, raising hourly salaries above federal minimum wage, and adopting “five freedoms of animal welfare” for its supplier chain. “Don’t Buy This Jacket,” screeched the boldface type in caps to accompany the image of a parka. 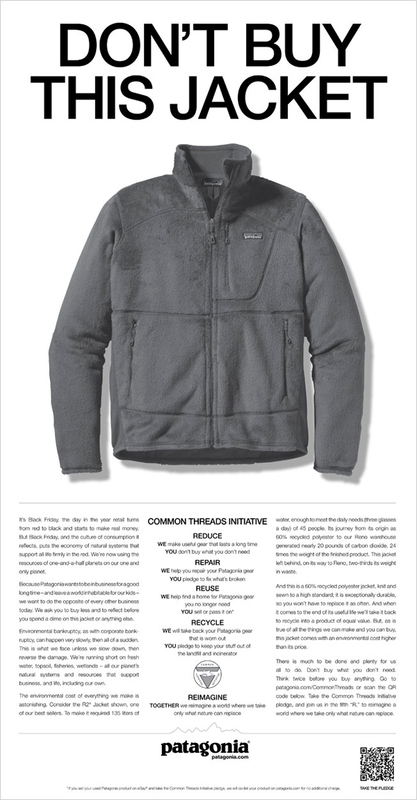 To launch their Common Threads Initiative, (reduce, repair, reuse, recycle, reimagine) the outdoor clothing maker grabbed attention in the New York Times on 2011’s Black Friday, a frenzied shopping day. As AdWeek explains about Patagonia’s startling spin on things, “The point is, Patagonia, whose business relies literally on the outdoors, is in it for the long term.” Actively protecting the environment is central to Patagonia’s core purpose or raison d’être. What happened to sales? According to Bloomberg Business, two years into the buy less campaign, outdoorsy customers pumped an extra US $158 million, nearly a 40 percent lift, into the company, which opened 14 additional store locations. Environmentalists may take note that Patagonia has launched “Twenty Million & Change,” a venture capital fund to invest in startups that share environmentally responsible corporate values. • Charles Schwab, the investment broker, highlights how they can help small investors who don’t really want, or need, to understand the stock market in depth to beat inflation. “Talk to Chuck.” was the groundbreaking campaign launched in 2005, years ahead of social media interactive conversations. Their personality-driven approach successfully carved out a unique positioning for the brokerage, squarely between the discount broker firms and the full-service Wall Street firms for larger investors. • Rubicoin, founded by Dublin-born Emmet Savage who is listed in Irish America’s Wall Street 50 (the list recognises the achievements of the most innovative Irish-American and Irish-born leaders in finance) is noted as one of the most successful investors in the world and this brand’s primary purpose is to get the world investing successfully, to remove the perceived barriers to accessing the stock market by giving everyone the basic ingredients required to successfully invest so they are empowered to change their lives financially. • Nike places their mission statement up front and center: “To bring inspiration and innovation to every athlete* in the world.” Note the asterisk on the word “athlete.” Former university track and field coach and Nike co-founder Bill Bowerman said, “If you have a body, you are an athlete.” Any questions? That’s certainly a mouthful for Mickey Mouse or a dreamy-eyed child…or just about anyone outside the boardroom. • Does your brand have a clearly defined purpose? Have you engaged in the brand profiling process using a system like the Personality Profile Performer™? • Is your brand’s purpose written in plain and simple language which everyone, both employes and customers alike, can clearly articulate on, or is it written in corporate lingo? • How often do you re-visit, re-evaluate and brand health check your expression of your brand purpose? • In what way is your brand’s purpose actively lived, expressed and shared with everyone in your business and interpreted by your employees? • How would your employees respond to the question of what excites them and gets them out of bed in the morning? • How and where is your brand’s purpose expressed to existing or potential customers? If you’re struggling to answer these questions maybe its time your gave your brand a brand audit health check or brand refresh. Feel free to get in touch, we’d love to help!